Cons: If one family having a mixture of accents among them bothers you, then that might be the one thing you find wrong about this production. A right hook of a play held up on the shoulders of a clutch of powerful performers who give their all. 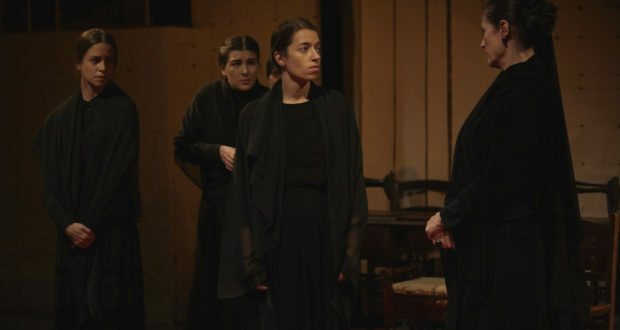 The House of Bernarda Alba is part of Spanish playwright Federico Garcia Lorca’s Rural Trilogy, all of which rebelled against the norms of contemporary Spanish society. The play is set in a small village in Spain, in the house of Bernarda Alba (if you hadn’t guessed), where she lives with her five daughters, maid Poncia, and several other servants. The patriarch of the house is deceased, and all Bernarda’s daughters are unmarried; the oldest, Angustias, is 39, where the youngest, Adela, is 20. Their every action is monitored and restricted, their mother’s concern being that they conduct themselves as women of their class are expected to, regardless of their personal feelings or desires. When a potential suitor enters the lives of the daughters, everything rapidly disintegrates; and it wasn’t that great to begin with. This is the first time I’ve seen Lorca’s work staged, and I couldn’t have asked for a better introduction. 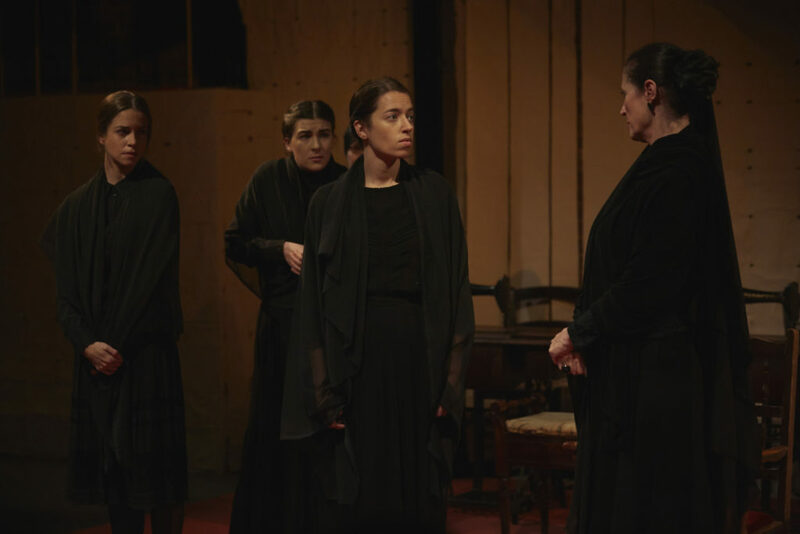 The Spanish Theatre Company’s aim is to present dramatised readings of all Lorca’s work; Bernarda is the last play he completed before he was assassinated in 1936. The performance space at The Cervantes Theatre was unusual to me as it wasn’t terribly small, yet in the performance space I felt cramped. I’m not sure even now that this wasn’t a response to the atmosphere of claustrophobia and sense of entrapment the ensemble create there every night: five women and their mother and her female servants all in one house, the mother imposing an eight year mourning period for the father because it’s what women of their rank do. This is a house without men. There is no patriarch present, and yet these women are still oppressed, governed by the opinions of others. Sound familiar? It should. It’s always a pleasure to see a variety of nationalities comprising a cast; the play is being performed in both Spanish and English (I went on an English night but brought a Spanish speaker with me. Just in case). I cannot fault any of the performers, the ensemble excelled. For me, the standout performance was that of Pia Laborde’s Amelia, one of Bernarda’s daughters, who delivered such a superbly natural performance as to be the scene-stealer, even when positioned at the rear of a group. The company have created an utterly believable, supremely performed show of eternally relevant torments that I’d encourage anyone to go and see.